Jones, S. C., Phillipson, L. & Barrie, L. R. (2010). 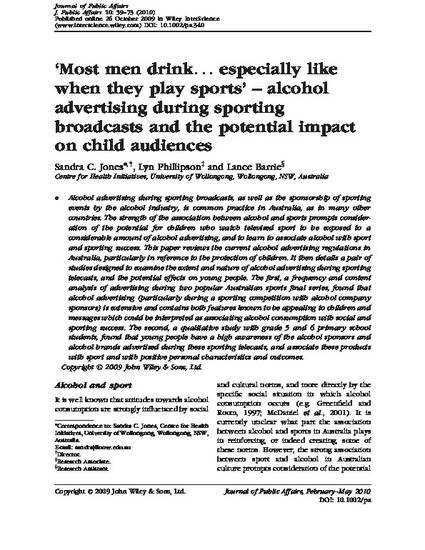 'Most men drink... especially like when they play sports' - alcohol advertising during sporting broadcasts and the potential impact on child audiences. Journal of Public Affairs, 10 (1-2), 59-73. Alcohol advertising during sporting broadcasts, as well as the sponsorship of sporting events by the alcohol industry, is common practice in Australia, as in many other countries. The strength of the association between alcohol and sports prompts consideration of the potential for children who watch televised sport to be exposed to a considerable amount of alcohol advertising, and to learn to associate alcohol with sport and sporting success. This paper reviews the current alcohol advertising regulations in Australia, particularly in reference to the protection of children. It then details a pair of studies designed to examine the extent and nature of alcohol advertising during sporting telecasts, and the potential effects on young people. The first, a frequency and content analysis of advertising during two popular Australian sports final series, found that alcohol advertising (particularly during a sporting competition with alcohol company sponsors) is extensive and contains both features known to be appealing to children and messages which could be interpreted as associating alcohol consumption with social and sporting success. The second, a qualitative study with grade 5 and 6 primary school students, found that young people have a high awareness of the alcohol sponsors and alcohol brands advertised during these sporting telecasts, and associate these products with sport and with positive personal characteristics and outcomes.